Since December 2009, Annie Chun’s — yes, she’s a real person — and CJ Foods stirred up some controversy over the debut of Annie Chun’s gochujang sauce in the U.S. And some in the Korean blogosphere have been gnashing their teeth over this potential corruption of Korean cuisine and they haven’t even tasted it yet. Even stores in Northern California, her American home turf, that stock other Annie Chun’s products don’t yet have that sauce. So, I bought a six-bottle case from the brand website, and five friends helped judge the culinary merits of this new sauce. Only one is somewhat a Koreaphile. Most have little to no prior experience with authentic cuisine. I gave each of them a bottle to test any way they saw fit, provided they would report with what foods they tried it and how the sauce complemented or clashed with their meals. The first to report was my Koreaphile friend, whom I will call “M.” She and her equally knowledgeable husband — whom I’ll call “J” — put the gochujang through the paces, testing it on everything from omelets and pizzas to honeydew melons. They even tried it on a mutual friend of ours — whom I’ll call “S” — and M’s father in law — whom I’ll call FIL. That’s plenty of feedback for a free bottle of sauce. FIL put it on everything too and even used some of the sauce in a recipe. FIL tried it on veggie burgers, omelets and red potatoes. Rub down the red potatoes with a mix of gochujang, olive oil and herbs. Hope that was helpful. We’ll finish the bottle for sure. Not sure if we would specifically go out and buy it. We’ll see. I thought the level of spiciness was good. There’s a real sweet initial flavor followed soon after by the heat. I thought it lacked an identity though, in other words, I wouldn’t know how to use it. The flavor isn’t such that I would use it in American dishes we generally make (I’m thinking of meat/barbeque in particular), and doesn’t have the right flavor for Asian dishes we eat. My husband said it doesn’t taste authentic. He did say it might be something he would use as a dipping sauce, for instance, for lumpia. YUMMMM! I was worried the spicy would take away from the flavor, but it wasn’t too bad. Not for anyone who doesn’t like spicy though. I give it a thumbs up! At first, I was at a loss on how sauce clearly labeled “Korean sweet and spicy sauce” can be “too Korean.” Then I had a flash: A fundamental flavor of Korean recipes is sesame oil. However, some people have a real aversion to that pungent ingredient, even in small quantities. This blend of gochujang has sesame oil and seeds, and it was enough for him to know that the sauce was “too Korean” for his taste. In sum, this gochujang is accurately named: sweet with a bold but not overwhelming spiciness. NextIs Alkongi a Boy or a Girl? We’re selling our own blend of gochujang here in SF — would you like me to drop off a bottle for you to sample? My friend T sent me another comment via FB: “So good! It had a great balance of flavor and spice. I thought that the spice was going to over power it, but it was really great. 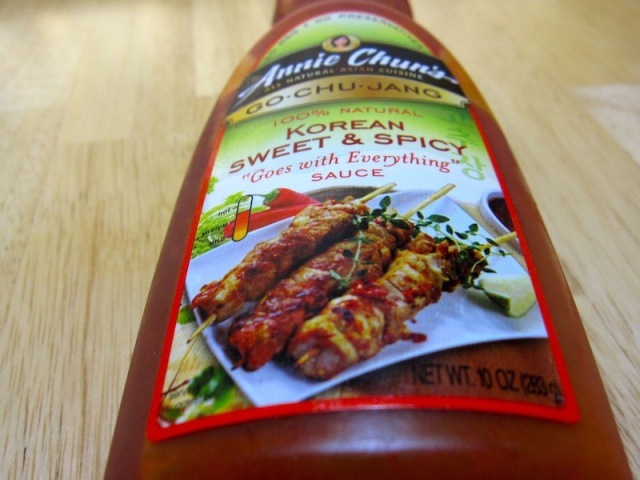 I would for sure purchase Annie’s Go-chu-jang again.” The question is when will one of our North Bay area grocery stores actually stock it. After all, I’m not going to give away anymore bottles! LOL! Korean tacos are one contender — or something crazy like the Gamja Fries at Namu. Personally I think it’s great on just eggs but I doubt that’ll be the “world-famous” pairing. Well, some sauces, like ketchup (before it was made only with tomatoes) and worchestershire sauce started as variations on fish sauce. Most of these gochujang variations (including Annie’s) are basically bibimbap sauce because they start with the straight gochujang paste and then add honey, sesame seed oil, soy sauce, garlic, etc., to make it a bit easier to stir into bibimbap.